Experience virtual MiniGolf on your computer and master an entertaining match on over 50 challenging courses, 18 of which have been faithfully modelled after official courses in the real world. 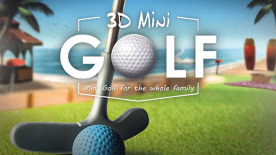 Three scenarios in glorious HD are waiting for the discerning mini golf enthusiast: a lovely green park, a camping site in the mountains and a dreamy sandy beach. Create your own profile to keep track of your statistics. Thanks to the integrated medal system you collect virtual rewards for your best matches. Try improving your own records in Challenge and Tournament mode or face off against your friends in Multiplayer mode. Enjoy exciting matches with 2-4 players. Merge Games - All rights reserved @2015.